Conceived, like the F.B.12, to utilise the 150hp Hart engine, the F.B.16 was designed by Rex K Pierson. Completed and flown in the summer of 1916, it was a single-bay staggered biplane with a fuselage faired out fully to an elliptical cross section, the Hart engine being partly cowled, and armament consisting of a single centrally-mounted synchronised 7.7mm Vickers gun. During the course of testing, the part-cowling was removed from the engine to improve cooling, the decking aft of the cockpit was cut down and new vertical tail surfaces were fitted. With the ending of Hart engine development, the basic F.B.16 underwent very considerable redesign, reappearing as the F.B.16A with a 150hp Hispano-Suiza water-cooled Vee-eight engine. This aircraft was destroyed in a crash on 20 December 1916, but a second identical aircraft was completed in the following month. 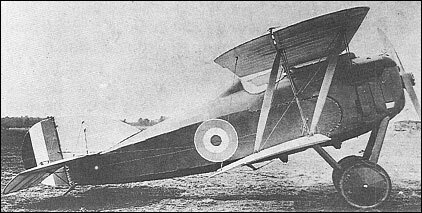 The F.B.16A had flat fuselage sides and the single synchronised Vickers gun was supplemented by a Lewis mounted above the centre section. After receiving favourable reports during Martlesham Heath trials, it was re-engined with a 200hp Hispano-Suiza engine as the F.B.16D, a wider-chord wing being fitted, with both gap and stagger increased, and a larger vertical tail fitted. The synchronised Vickers gun was replaced by a Lewis firing through the hollow propeller shaft. Because large contracts had been placed for the contemporary S.E.5a, particularly with Vickers, and because Martlesham Heath evaluation contained numerous design criticisms of which rectification would have been time consuming, the F.B.16D was not ordered into production. Nonetheless, work on a further development, the F.B.16E, continued, this having a 275hp Lorraine-Dietrich 8Bd eight-cylinder Vee-type water-cooled engine and two 7.7mm synchronised Vickers guns totally enclosed in elongated blisters between the cylinder block fairings. The F.B.16E was tested at Villacoublay by the French authorities, encouraged by the manufacturer's performance claims, including a speed of 220km/h at 3050m and the ability to climb to that altitude within 7.85 min. During Villacoublay trials, the F.B.16E allegedly returned performance figures unsurpassed by any of its contemporaries, but no production order was placed, and on 29 July 1918, the prototype crashed after its propeller disintegrated. but no production order was placed, and on 29 July 1918, the prototype crashed after its propeller disintegrated.